Enjoy the art in your photographs in different styles and techniques and choose what you like! PhotoChances Explorer will run as a slide-show picking your digital photographs and applying spectacular image processing effects chosen at random (the original images will remain untouched).Each image shown can be saved with the effect at the resolution of the original picture.Once you capture any image you can reproduce that same effect in any others. *Rediscover your old photos. PhotoChances can handle large collections of photographs spread on different folders and optionally show them randomly. You will see photographs you maybe forgot or perhaps discarded. *Discover old and new images with new interpretations and capture anything you like. 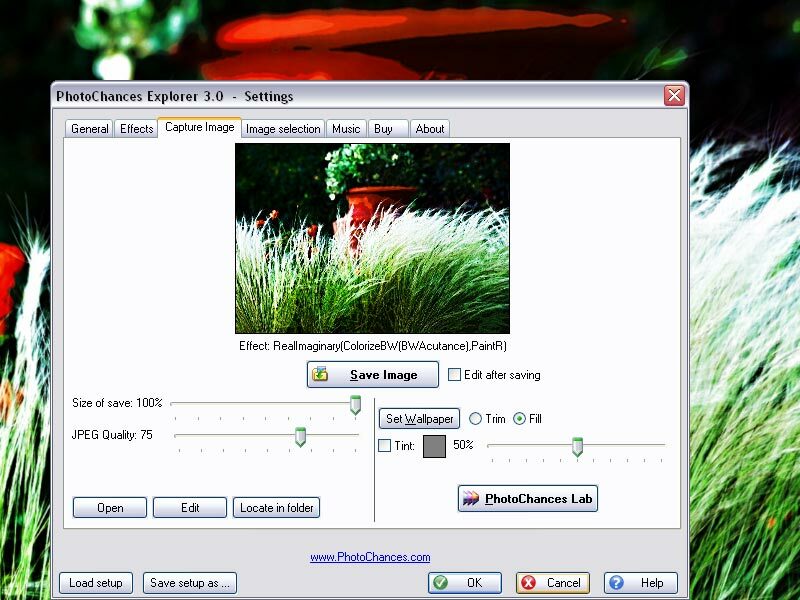 Qweas is providing links to PhotoChances Explorer 4.3.001 as a courtesy, and makes no representations regarding PhotoChances Explorer or any other applications or any information related thereto. Any questions, complaints or claims regarding this application PhotoChances Explorer 4.3.001 must be directed to the appropriate software vendor. You may click the publisher link of PhotoChances Explorer on the top of this page to get more details about the vendor.